Normally, the photos and videos that have been taken remain stored on your phone, such as Galaxy S8, until a user transfers them to another device. However, there are occasions that these items can be inadvertently lost and need to be recovered so that they can be accessed again. Two of the more commonly known problems usually appear when someone who has this type of device deletes them accidentally or the photo files and the videos have become corrupt. 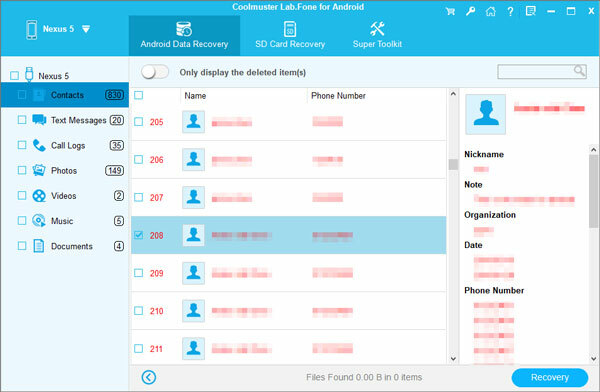 With professional software like Coolmuster Lab.Fone for Android, you can recover the deleted and lost photos/videos from Samsung Galaxy S8 easily. Such kind of Android data recovery program is highly recommended by the users and it enables you to recover other types of data, such as call history, contacts, text messages, music, documents and more from Samsung Galaxy S8, as well as S7, S7 Edge, S6, S5, S4, S3, Note 7, Note 4, Note 3, Galaxy A9/A7/A5, etc..
Below is the tutorial on how to use Lab.Fone for Android to retrieve deleted photos and videos from Samsung Galaxy S8. How to Recover Lost Photos/Videos from Galaxy S8? Launch the Galaxy S8 photos/videos recovery tool - Lab.Fone for Android on your computer. Connect your Galaxy S8 with the same computer using a USB cable. The software automatically recognizes your S8. Choose the categories of "Photos" and "Videos" and click "Next" button. Then, the program starts to scan your Galaxy S8 phone to find all lost and exiting photos and videos in your S8. The lost ones are displayed in red color. Preview and select the photos and videos that you want to recover and give a click on the "Recover" button to begin the recovery task. All the recovered Galaxy S8 photos and videos will be saved on your computer.